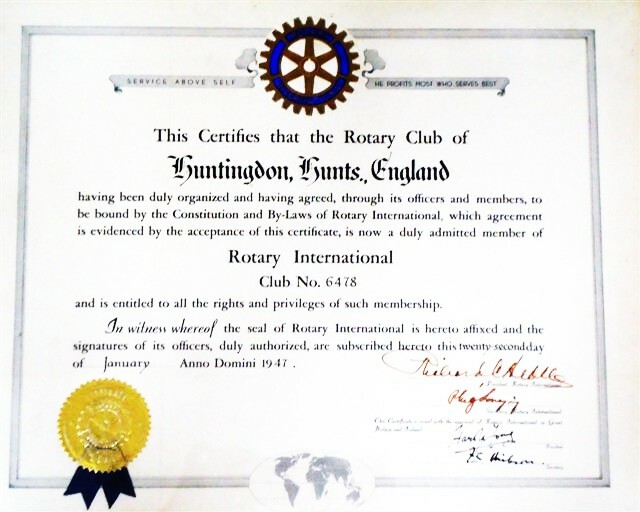 Formation of a Rotary Club in Huntingdon was first considered about the year 1926 but no active steps were taken for another 20 years. We were sponsored by The Rotary Club of Peterborough and received our Charter on 22nd January 1947. The annual subscription then was £2. 12s. 6d, the entrance fee one guinea! The Club had 19 founder members; we were very proud of PP Ken Beaton who remained a valued member of the Club for over 60 years. Early projects were a Careers and Hobbies Exhibition and in the International field ‘Aid to Greece’ in 1952, after their civil war, and entertainment of parties of German children. In 1977 we built the river mooring adjacent to the Hartford Road, to mark the Queens Silver Jubilee. Our own Golden Jubilee project was the purchase of an ambulance for St John Ambulance. Membership was greatly enriched when women members were admitted in 1995 since when there have been an average of about 40 members. In 1961 the Inner Wheel Club was started and has remained a very valuable partner. The Club is proud to have sponsored The Rotary Clubs of St Ives (1953), Ramsey (1969), Huntingdon Cromwell (1982) and Huntingdon Hinchingbrooke (2000), the first Probus club in the area (1973) and the Rotaract Club (1977). Over the years we have undertaken many shared projects including the erection of the millennium clock in Huntingdon High Street. 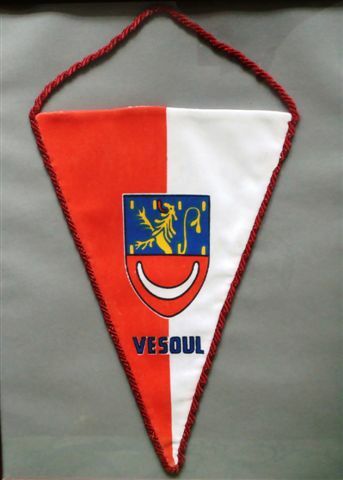 In 1964 first contacts were made with our twin club Thisted in Denmark and a few years later we also twinned with Vesoul in France. Valued exchanges have continued ever since and we have supported them in joint International projects. Projects undertaken are too numerous to mention. Favourites have been the Rotary Youth Leadership Award scheme supported since it inception in 1985, the award of an annual Environmental Trophy and prizes to Hinchingbrooke and St Peters Schools annually for over 40 years for ‘the boy and girl who by their behaviour and enterprise in promotion of the school’s interests, made an outstanding contribution to school society’.